Last week saw the launch of a new exhibition at the Fashion and Textile Museum in Bermondsey, south London. Made In Mexico: The Rebozo in art, culture & fashion looks at the classic Mexican shawl made famous in 20th century culture by artist Frida Kahlo and explores the key role textiles have played in promoting Mexican culture worldwide from the 17th century to the present day. As previously reported, students from BA Textile Design at Chelsea have contributed to the show. They were invited to design and produce their own take on the rebozo, a traditional Mexican shawl and four BA Textiles students have their creations on display in the exhibition: Yixi Cai, Rosie Danford-Phillips, Margaux Barron and Ziyi Yang. Yixi and Rosie were the winners of the Student Cultural Exchange competition, launched by the curator of the exhibition Hilary Simon at Chelsea and we chatted to them at the opening about their work. 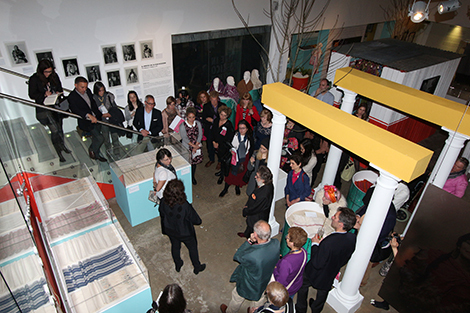 Rosie Danford-Phillips with her rebozo at the Made in Mexico exhibition at the Fashion and Textile Museum. Photography by Gavin Freeborn. As well as having their work on display as part of the exhibition, they have also had the opportunity to fly out to Mexico to study at the Universidad Iberoamericana in Santa Fe, Mexico City, where they will work alongside the students there and get a taste of Mexican life. Yixi added “As well as the museums and markets, I have heard that there are lots of artists in the public parks there and I’m looking forward to seeing them at work out in the open”. 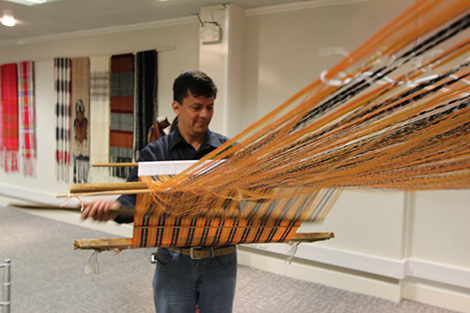 A man using traditional ‘backstrap weaving’ techniques to create a rebozo at the opening of the exhibition. Photography by Gavin Freeborn. We will post updates from Yixi and Rosie about their trip on the blog later this month. If you’d like to see their work, the exhibition runs from 6 June – 30 August 2014. 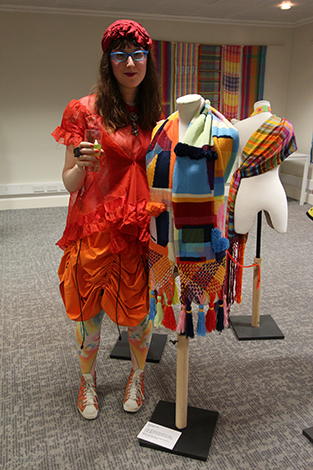 Find out more about studying BA Textile Design at Chelsea College of Arts on our course pages.